Hi guys, hope everyone’s been well and keeping warm , I’m having the hardest time with flu and I’ve been bed ridden for 2 whole days, so this post is a tad bit late because of that reason, but let’s get right into it! 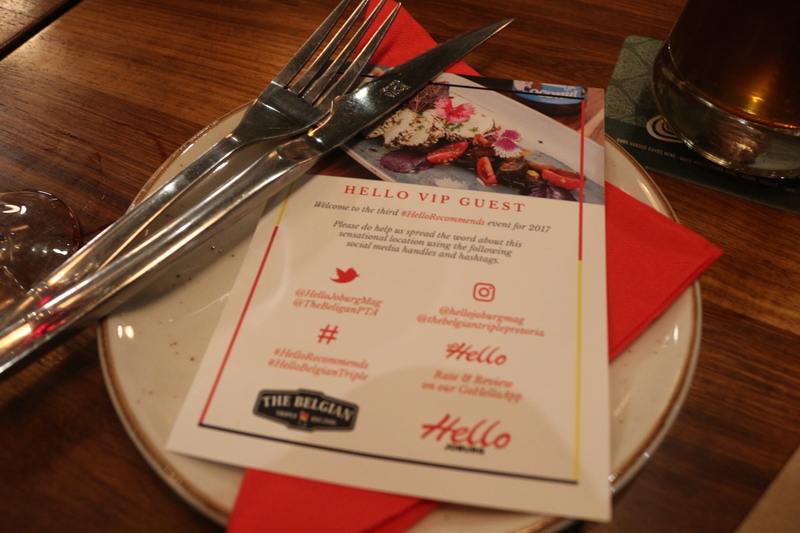 So a few weeks ago, I got an invite, along with a few other bloggers to attend a VIP evening of menu tasting with Hello Joburg magazine and The Belgian Triple, and this Wednesday, off we went to Pretoria. So we left a bit late, and got stuck in traffic and I was starting to get a bit anxious, but we eventually made it, and the owners of the restaurant welcomed us with some warm Gluwein, a spicy wine perfect for a chilly evening. On first impressions, I assumed we were at a really nice pub, they have a gorgeous keg wall and beer taps imported from Belgium. 81 craft beers on offer!! Our awesome waiter came through to take our drink orders, and I’m although I’m a wine gal, I let him suggest a beer to try and in a jiffy, he was back with the Lindermans Faro. With ONE sip, I was converted to a beer lover! It was amazing!! The beer is quite sweet with a flavor I’d explain as citrusy maybe? It wasn’t long before our starters came out, and because of my intial impression of pub like food, I was pleasantly surprised at the beautiful offering we received! The most perfect platters of Bitterbollen,Kroketten,Squid and Marinated Olives and fried with mayo. Basically fried shredded meat, cheese, Squid! SO AMAZING!! In between courses I decided I’d try another beer, the Delirium Red! It kind of tastes like cranberries in beer.. It’s Ok but I eventually went back to the Lindermans Faro. Something that’s really awesome about the restaurant, is all the beers come in branded glasses that have the name of whichever beer you’re drinking, and the coasters too! How awesome!! OR A pan seared Norwegian salmon fillet,Balsamic Roasted Beetroot, Thyme Parisian potates and cream sauce. The thing about me, is although I’m a foodie, I really like my steak well done, and I’ve been hearing that this is the worst thing to do a piece of good meat, well the option here was medium rare and medium rare! Boy oh boy was I HAPPY! 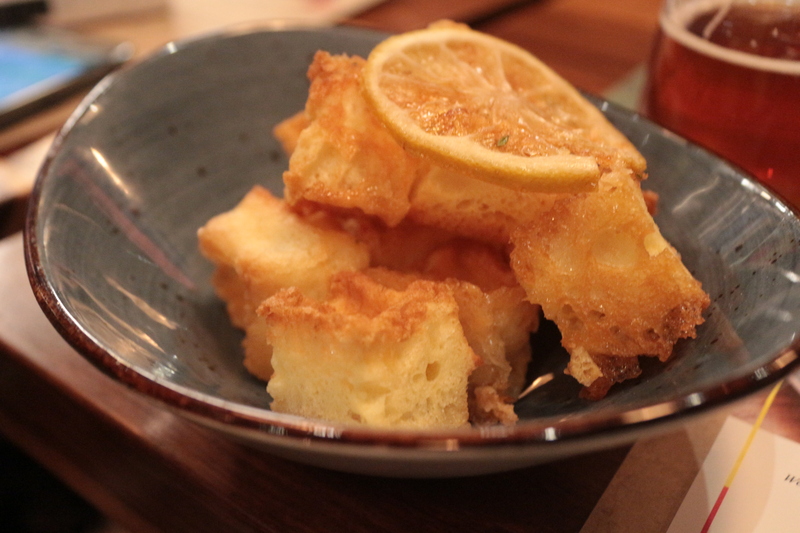 The meal was perfect, the flavors married into each other so beautifully! The meat! I also had a bite of my friends salmon and perfect! Crispy on the outside and moist inside! Our last course was the dessert! Delirium Red poached pears with a vanilla syrup, as well as Kriek Pannacotta with chocolate cigars,wafer tule and toasted almonds. All I can say is magical.. every bite (and I had everything) was a constant love affair for my tastebuds!! We had such an amazing evening, the owners are so friendly, the waiters are so incredible, the food is A+ and the prices make everything sooo much more greater! This is a spot I can definitely see myself frequenting, in fact I have plans to take a buddy of mine who’s just moved to Pretoria. Olympus Village Shopping Centre. c/o Olympus Drive & Achilles Road. Pretoria. You should definitely make your way there soon guys! Thank you to the team at Hello Joburg for an incredible evening! Previous Post Bright Life Salad..
Next Post Roast Tomato Soup..